I arrived in Fukuoka last night after a 10-day meditation retreat in Kyoto and a couple of days visiting with the in-laws. 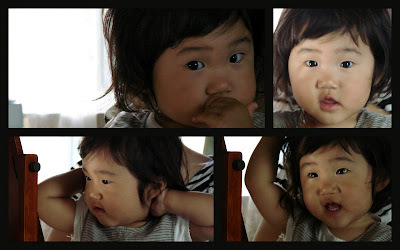 I will write more later about the Kyoto experience, but for now wanted to let you have a look at my niece. We still had some trouble communicating, as we have had since the last time we met. Besides her mother and grandmother, Shiori is wary of contact with anyone else, including aunt Mutsumi and uncle Jeff. When you start to get close, she begins breathing hard and whining, and if you come too close may begin crying. If you approach while her attention is diverted, though, she has no time to anticipate and react. In this way I was able on our last night to carry her through downtown Sannomiya with only a small initial whine. Perhaps she enjoyed the elevated point of view.